If you think I’m giving you this article for free… think again. It’s costing you something very valuable — your time. As a result, I have to sell it to you. I have to sell it as if I was asking you for money. When you promote blog content through an email newsletter you need to apply many of the same principles you would when selling products and services through email. 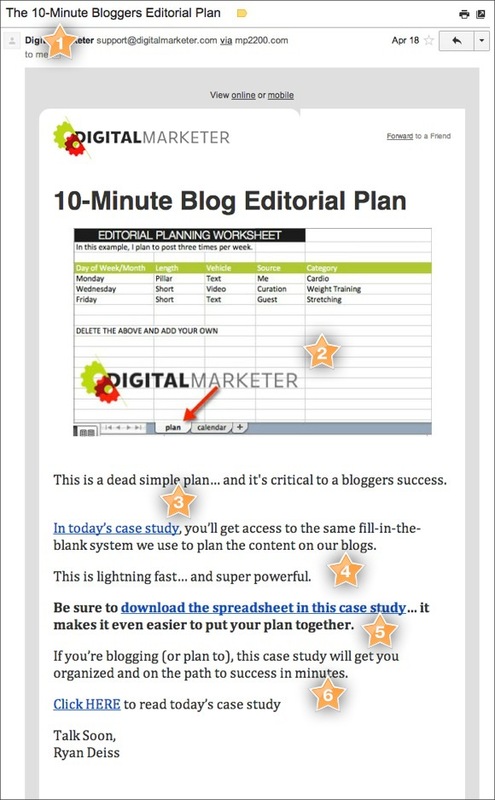 In this article you’ll get access to Digital Marketer’s Top 10 email newsletters promoting our blog content. 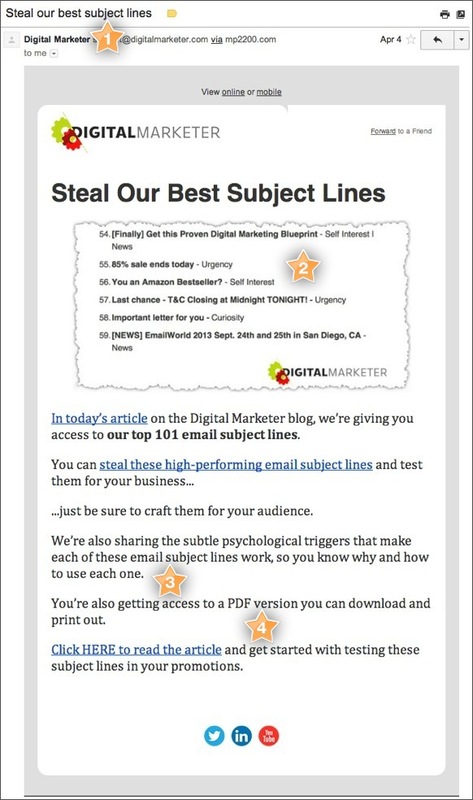 These 10 email newsletters enjoyed our highest click through rates. 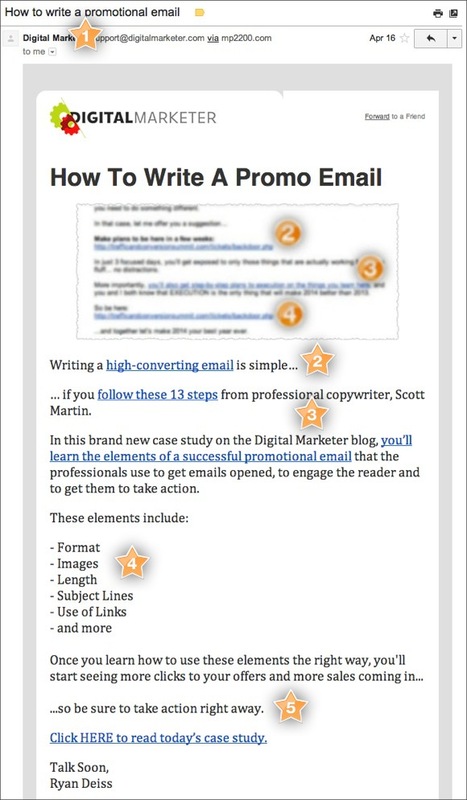 I’ll show you each of these emails and break down the science behind writing content emails that get clicks. Note: Each email screenshot contains numbered stars like this: ‘ These numbers correspond with the analysis below the screenshot. Curiosity is a powerful motivator but often doesn’t work well by itself. 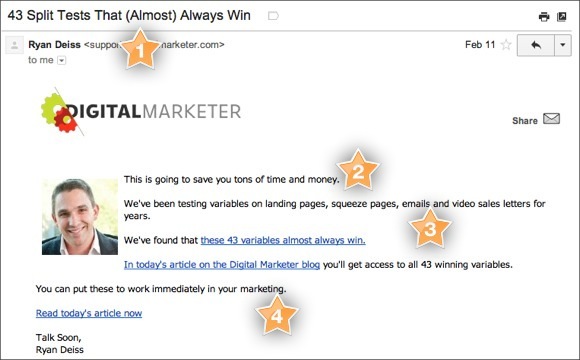 This email uses curiosity plus a heavy dose of benefits to get clicks. 1) The subject line contains the phrase [NEW FORMULA] communicating that this is new and something the reader may be unaware of. 2) The image (while admittedly ugly) builds curiosity and previews the content. 3) The opening line restates that this is new and therefore worth the reader’s attention. 5) This sentence calls out the audience. 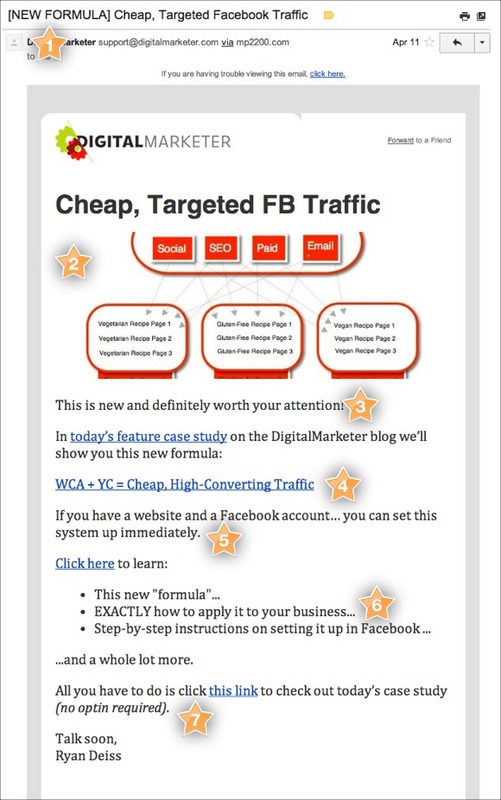 If you’re interested in Facebook marketing, this is for you. 6) This quick bulleted list restates the benefits and builds value for the piece of content on the other end of the click. 7) Adding ‘(no optin required)’ lets the reader know that they can get instant access to these benefits by clicking. Need some proof that your content is good? Borrow the proof from a rock star. Use Oprah, Steve Forbes, the Wall Street Journal… anyone (or anything) with rock star credibility in your niche. In this email we “piggyback” off of the expertise of Bill Glazer and Dan Kennedy. 1) The subject line contains a specific benefit. 2) Here’s where we borrow credibility from a rock star. Don’t do this unless you’ve done it ethically. In this case the author, Julie Boswell, worked directly under Bill Glazer. 3) This phrase restates and “links up” the benefit. 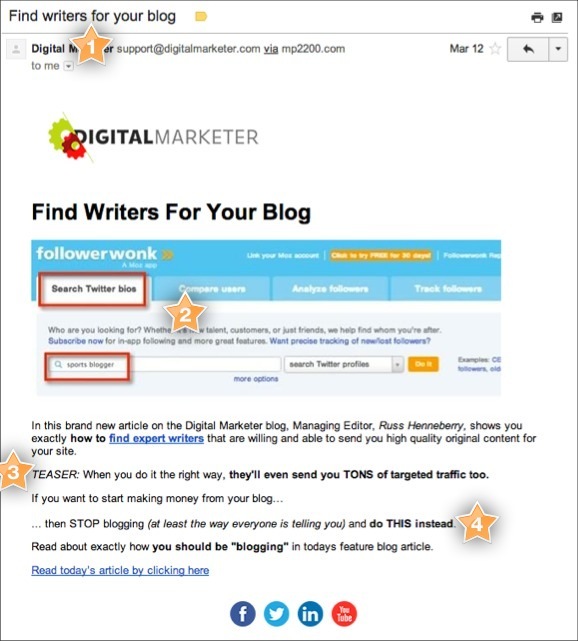 You’ll notice that most of our emails (content and promotional) contain at least three links — all to the same page. 4) The phrase “simple trick” makes the benefit more attainable. Your reader wants results… now. If you can communicate speed in your email copy — do it. 2) The image shows the benefit of the click. Don’t forget to link the image to the blog post! You’ll lose a lot of traffic if you fail to do this. 3) The term ‘dead simple’ continues to promise ease and speed to results. 4) Again, the term ‘lightning fast’ is used to communicate speed. 5) A downloadable resource is promised… content emails that promise additional resources get more clicks. Access ‘The Simple 7-Step Autoresponder Sales Sequence’ Execution Plan in Digital Marketer Lab. Learn to write a quick and effective email autoresponder series that sells a product or service on autopilot. Sometimes it pays to be brief and leave the reader little to do but click on the link. Just be sure to communicate strong benefits in the short amount of time you have. 1) Strong, benefit rich subject line. Notice how the word ‘Almost’ makes the benefit more believable. 2) The first line hits the two most desired benefits of our readership — save time and money. 3) More, straight forward benefits. 4) This last line ‘You can put these to work immediately…” communicates speed to results. 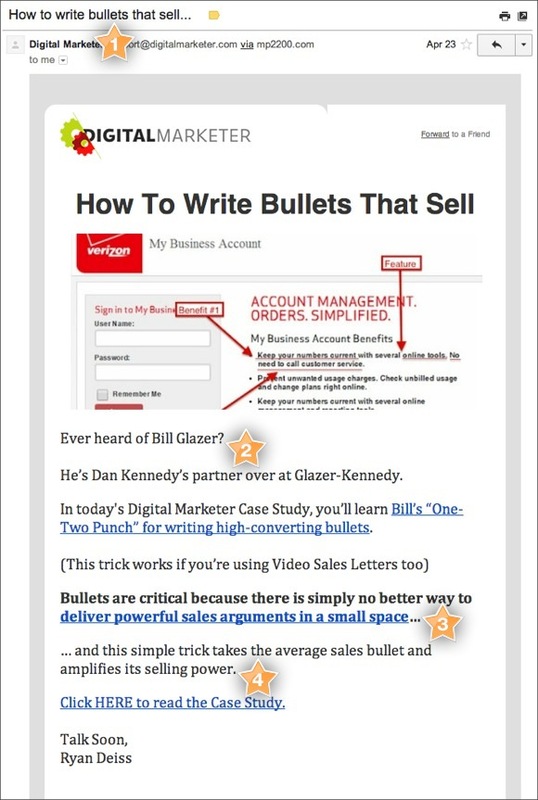 In this email we use a bulleted list to break up the copy and give the reader a taste of the content they can expect. 1) A simple, “how to” subject line containing a benefit that is relevant to the reader. 2) This first line communicates the benefit and reassures the reader that this benefit can be easily attained. 4) In the bulleted list we give the reader a preview of the content. 5) A strong call to action closes the email. You’ll often get more clicks by alienating some readers and “calling out” the ones that will get the most benefit from the content you’re promoting. 1) The subject line states the topic and benefit and “calls out” to the reader that would be interested in this topic. 2) The image builds curiosity and, if read, gives a taste of what will be learned in the blog post. 3) This first paragraph builds credibility for the author by “piggybacking” off of the status of Dan Kennedy and Bill Glazer. 4) This sentence is a pure “call out” to the reader that will benefit from this content. 5) This final sentence borrows more credibility from Frank Kern and John Carlton — two legendary copywriters. Your reader is asleep at the wheel. If your content follows the same pattern as everything else… your response will suffer. Find ways to break up the pattern and get your readers attention. 1) A very simple, benefit rich subject line that calls out the correct audience for this content. 2) The image is of a tool that will be discussed in the post — it builds value… and curiosity. 3) The addition of this “Teaser” sentence tacks on a curious benefit the reader may not have expected. 4) This last sentence uses a pattern interrupt stating “If you want to start making money from your blog… then STOP blogging…” It causes the reader to pause and read it again more carefully. If your content reveals something your reader is likely unaware of… be sure to highlight it. You’ll see higher click through rates. 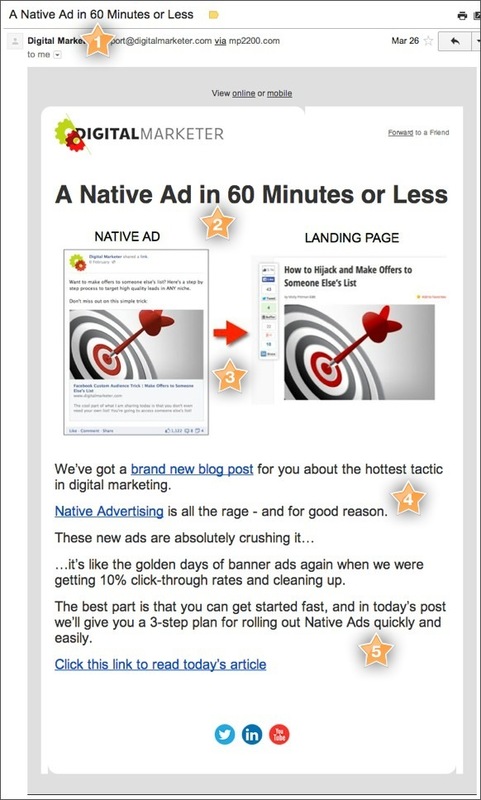 In this email we are promoting a blog post about a new digital marketing tactic that most of our readers were not familiar with… Native Advertising. 1) The subject line communicates speed to results. 2) This email (like many of our content mails) contains a benefit rich headline. 3) An image that builds curiosity and gives the reader a taste of the content. 4) The phrases “… hottest tactic in digital marketing” and “Native Advertising is all the rage…” let the reader know that this topic is trendy and new. 5) The last sentence communicates speed to results. Several of our top performing blog post emails contain a promise to deliver an additional resource. 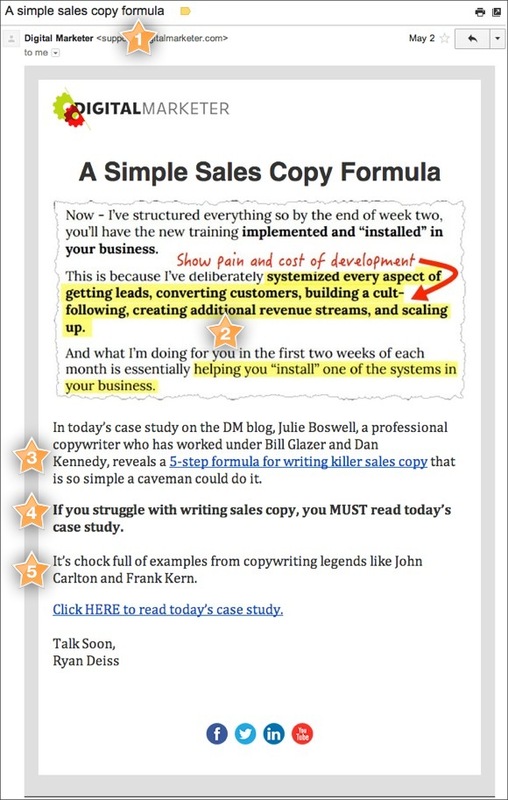 In this post we simply turned the article into a PDF for download and highlight that in the email. 1) The subject line promises a shortcut to results by inviting the reader to “steal” from us. 2) The image previews the content by showing a chunk of the PDF download they’ll receive. 4) This last sentence before the call to action promises the bonus resource of a PDF download. Last, but certainly not least is this pesky issue of providing value… and lots of it. There is no trick or hack that will save your blog if the content isn’t outstanding. In the end a real human will click through on your email newsletter and consume the content. That, more than anything else will determine whether you get more or less clicks the next time you press SEND to promote a piece of content to your email list. 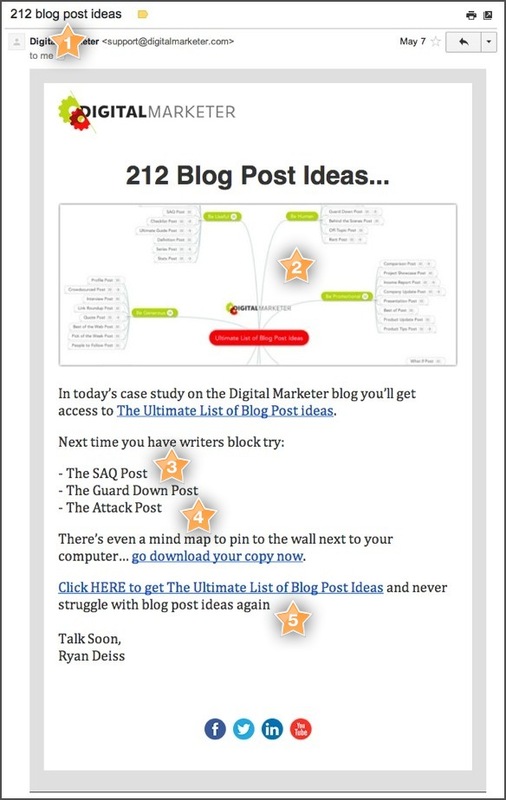 I leave you with our top performing email promoting a piece of content on our blog. It performed well, in large part because we promised tremendous value and (if I do say so myself) delivered on that promise. 1) Big promise in the subject line. 2) The image previews the mind map resource delivered in the content. 3) A bulleted list builds value and curiosity by highlighting some of the more strangely named blog post types. 4) The last paragraph before the call to action promises the additional resource that tips the content from good to great. 5) The last sentence clearly restates the benefit of the content. Your turn. Let’s discuss blogging, email newsletters and content strategy in the comments below. I want to hear from you!